A blurry picture of a “Nuts 5 Nuts” stand on the streets of Santiago. Chile is widely considered to be one of the most “Americanized” countries in Latin America, and one of the reasons for this is that most business transactions take place through a corporate intermediary. In Argentina and Uruguay, by contrast, there are many honey-roasted peanut vendors on the street, but their little stalls are their own and show no corporate logos. Chile’s vendors, however, work behind garish orange stalls like this one, working for one company or another. Well, as it happens, the fellow responsible for New York City’s “Nuts 4 Nuts” peanut stands is a Chilean immigrant, and most of the people who work for “Nuts 4 Nuts” in New York are too. 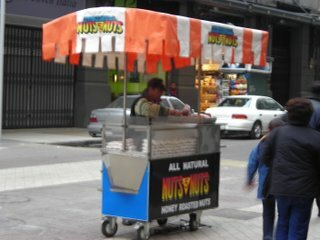 This guy is pretty famous in Chile as someone who went to the United States and “made it.” As a sort of reverse-export, the streets of Santiago are filled with “Nuts 4 Nuts” stands as well, and so all of the signs are printed in English. The pun in English is not at all well understood, even when the words are. Thus the Chilean competitor who decided to make a “Nuts 5 Nuts,” because 5 is obviously better than 4.